The Annex® multi-family housing development will open their doors to University of Wisconsin – Oshkosh students in fall of 2018. Indianapolis, IN, August 2, 2017 – Indianapolis based student housing developer Annex Student Living® acquired the former Lamico factory site located at 474 – 482 Marion Road, in Oshkosh, Wisconsin on July 27, 2017. Construction activities have begun on the 140 unit/ 310 purpose-built multi-family housing development that will serve students of the UW Oshkosh campus and young professionals of the community. 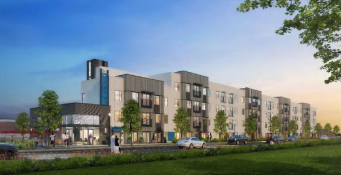 Located just a quarter of a mile from the UW Oshkosh campus and near Riverwalk along the Fox River, The Annex® is the first purpose-built multi-family housing project in the Oshkosh market. Designed by KTGY Architecture + Planning, will offer fully furnished 1 bed/1bath, 2 bed/2bath and 4bed/ 4bath apartments. Units will include an in-unit washer and dryer with contemporary finishes. Amenities include an outdoor fire pit, substantial bike storage, exclusive fitness center, study work space and a clubhouse designed for resident gatherings.